With all the sunshine over the weekend, which melted some of the snow, it made you wish for springtime. I too am ready for all the snow to be gone and the flowers to be blooming. I swore I heard birds the other morning, and I think they are ready for the spring too! As March approaches, I feel the need to put some of the heavy winter clothes away, the blankets that we curl under back into the closet but the reality is -- its still winter. 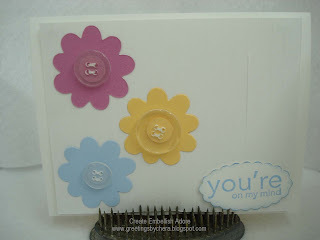 Todays card is the little bit of springtime I am wishing for.